South Africa can facilitate investment and development of Africa’s nascent ocean economies. By Timothy Walker for ISS TODAY. Earlier this year, South Africa’s International Cooperation, Trade and Security (ICTS) cluster promised that “as part of our priorities as chair, South Africa will promote aligning Operation Phakisa: Oceans Economy with the Indian Ocean Rim Association’s Core Objectives of the Blue Economy”. Also, South Africa needs to establish and consolidate mechanisms for resolving disputes arising from clashing interests. Now is the perfect time to better promote African issues and interests in maritime security, development and governance. If states lost sight of the benefits of collaborating, or international power politics get in the way, that would hinder attempts at building Africa’s blue economies. This can help overcome the deep challenges of skills shortages, dependency and lack of capacity that have bedevilled the implementation of many African maritime policies. In these ways, South Africa has ambitiously linked the establishment of its domestic ocean economy to the consolidation of a peaceful and co-operative international maritime regime in the Indian Ocean. This should also revive and enhance the implementation of African maritime strategies. Timothy Walker is a Researcher, Peace Operations and Peacebuilding, ISS Pretoria. 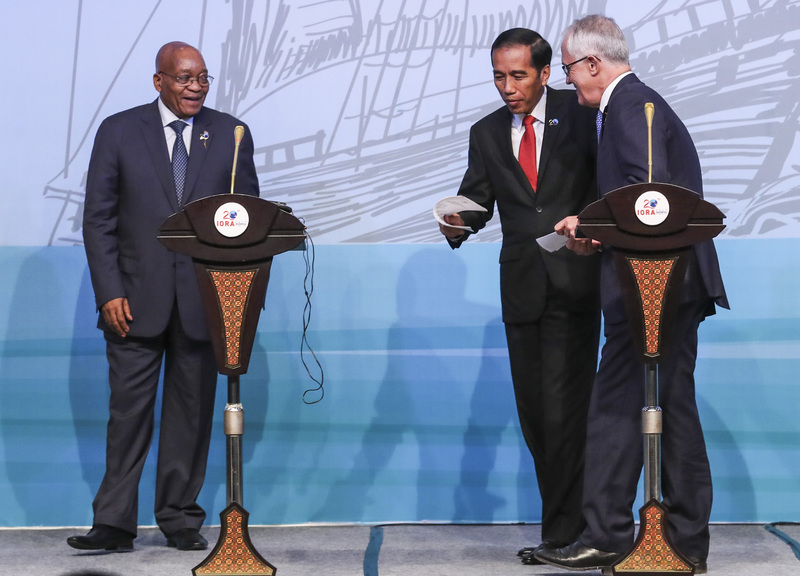 Photo: Australia’s Prime Minister Malcolm Turnbull shakes hands with South Africa’s President Jacob Zuma as Indonesia’s President Joko Widodo stands in between shortly after a joint press conference at the Indian Ocean Rim Association (IORA) summit in Jakarta, Indonesia, 07 March 2017. Photo: Mast Irham/(EPA).